Welcome back, spooky Cosmos Gaming fans! 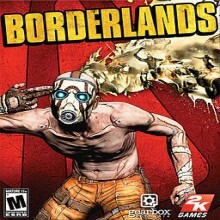 Today we’re taking a trip to Borderlands! First off, if you must get it, don’t get the PC version. It’s buggy, the multiplayer is lacking, and it releases and updates behind the consoles. If you DID get it, well, let’s try to focus on the positive. If you didn’t get enough of it in Fallout 3, Borderlands offers more of the FPS/RPG love. Gearbox’s twist is that the loot system is something out of Diablo, and combat feels more like Halo. The improvement over all of these is Borderlands offers almost-free respecializing, you can easily compare weapons that are equipped, in your inventory, and in the shop, and the different character classes differ in play style, instead of just the straight Solder or Mordecai that Halo players would be most familiar with. And that brings me to the discussion of the different character classes. The Brick is your meat tank. He walks up and punches them, tosses grenades, or shoots them with his rocket launcher. His specialty is a berserk rage which has different abilities depending on your skills. The Mordecai is your Sniper with a pet killer bird. You can either focus your skills on your Sniper Rifle, or on the bird. The Soldier is your all-purpose bullet-spammer. He can heal, shoot things with his special turret, or he can shoot them with his combat rifle. The Siren can be played either as a Mage, with area-of-effect abilities, or as a Rogue, by going invisible for a moment then filling them with bullets, or as a debuffer by Dazing enemies, which slows down their movement and attack rate. Many of the skills are only useful upon the death of an enemy, which come in two varieties: Might As Well Be Tissues, or Built Like Fort Knox. They also respawn on a set timer, or on a location trigger. The quests in Borderlands consist of fetch quests or kill quests, much like Brutal Legend. What is not like Brutal Legend is that oftentimes, in pursuit of one quest, you come across the objective for another quest or two, so frequently, you can work on several quests at a time, and turn them all in for money, experience, and randomized weapons. Yes, yes, Borderlands has a billion gajillion weapons, as well as lots of energy shields, grenade modifications, and “plus to skill” modifications. Certain red chests have better odds of dropping loot for your class, so saving and booting up your game again is a common tactic for easy money and hopefully better guns. The way you can tell loot apart at a quick glance is by looking at the fictional manufacturer, the cash worth, level, and the prefix, suffix, and serial number of the gun. Deeper looks require comparing them side by side with guns you own or equip, and can frequently lead to the tearful retirement of a favorite gun. As expected, different guns behave in different ways. A combat rifle is best used with rapid clicks of your firing button, while a SMG only needs you to hold it down, as it reloads automatically. And well, if you don’t know how to use a Sniper Rifle by now, you’re not likely to learn from this game, either. An odd thing about Sniper Rifles or any weapon with a scope-like zoom, is that little circle in the middle, around the dot. That is your Accuracy Cone. When you fire a gun in zoomed mode, your bullets may fall anywhere within that circle. The higher the Accuracy on a gun and the points in your Accuracy-boosting skills, the smaller that circle, and the greater the chance that your bullets will hit where you aimed it. The music is entirely forgettable, except for two exceptions, both of which you can sample elsewhere online, and listening to the looping tearful whining or ADHD mock-cheerful commentary of the trapezoidal robots in the game was almost enough to make me mute the game, just so I wouldn’t have to hear it anymore. At least on the PC, driving the vehicle was simple and intuitive, just don’t let it blow up on you, or get stuck on scenery, or you’re pretty much dead. Dying is also not that bad, as for several seconds after something takes out your last hitpoint, you can kill something, and you get a “Second Wind,” in which your shields are recharged and you get a quarter of your health back. Failure to do this teleports you back to a Save Point Pole for a 10% donation of any cash you had on you. No need to repair gear, just buy more bullets. No way to deposit your money in a bank, though. Other than that, dying is a painless affair. Graphically, the game looks like some odd combination of polygonal and cell-shaded, and the environments varied about as much as they did in Fallout, complete with a day/night cycle. I imagine they’ll look even better with a decent graphics card. Background Music is entirely forgettable, sound cues are non-existent, and you’ll want to wall bang if you had to listen to the Claptrap Robot for much longer than absolutely necessary. There are only two tracks worth listening to, and that is the Intro and the Final Credits. One point for each. THIS is what you bought the game for. Patches fix many issues, including the multiplayer. See above. After you beat the final boss, you can do their version of a New Game Plus, and restart with all your gear, money, and levels for the privilege of beating the game with all the enemies leveled up too. The other three classes add some replayability. If you need some more Fallout 3 in your life with more loot and multiplayer capability, this is the game for you. If you didn’t like Fallout 3 at all, forget it.